This handy guitar octave chart will help you find root notes all over the neck, therefore enabling you to play chords, scales and arpeggios in all different shapes or patterns. Starting on the B note located on the 6th string, 7th fret, use the octave shapes to find all the other B notes on the neck. Play chord, scale or arpeggio shapes with roots on the B notes around the neck to find your preferred sound. Now change to an A note on the 6th string, 5th fret and repeat the process. Remember, learning and memorizing notes, chord voicings and scales in this way will improve your playing skills, theoretical knowledge and desirability as a band member. 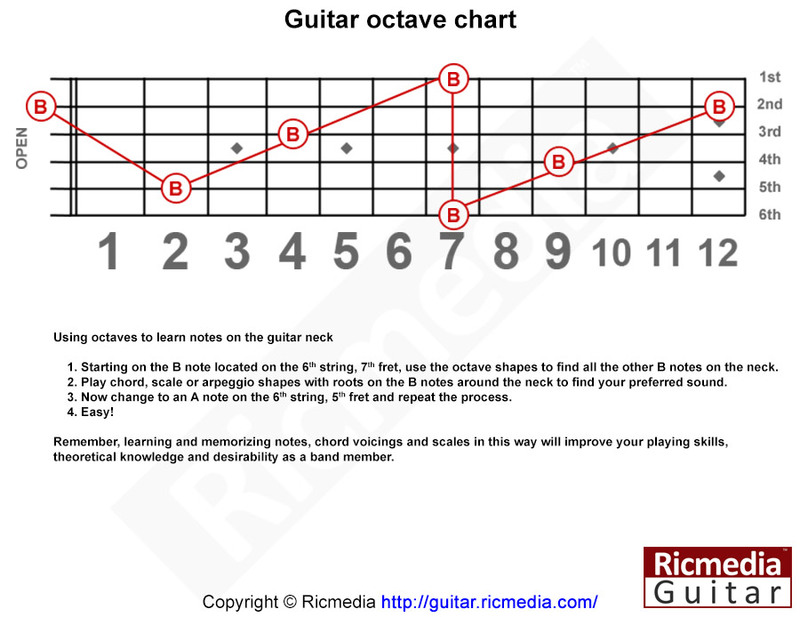 You can also download or print Guitar octave chart and guide.